Cherry tree for sale – strong tree, need to graft chilling hours or cool winter (depend on the cultivars), if the tree attack in the beginning of the winter need to collect all the leaves and the fruit from the ground, cut all the infected branches, half to full sun, average to big amount of water, the best season to plant Cherry tree it’s in the autumn to early spring, when collect the fruits it’s important to take the fruit with the small stem, better for preserve the fruit and for the tree. 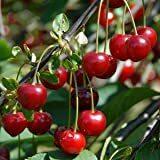 Sweet Cherry Trees fruit shape round, size 1-3+ cm, color of the fruit can be: red orange, black, purple, pink yellow, fruits mostly grow in pair but can be more, the tree bear fruit after 3 years fruit can be used: alcoholic beverages, beverage, dried fruit, eaten raw, fruit, ice pop & ice cream plants, jams, juice. 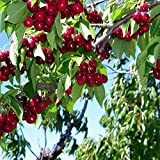 Sour Cherry Trees fruit edible in round shape, size 1-2 cm (rarely more), color of the fruit: red to purple-black, the fruits mostly grow in pair but can be more, the tree bear fruit after 4-5 years, fruit can be used: alcoholic beverages, beverage, dried fruit, eaten raw, fruit, ice pop & ice cream plants, jams, juice.